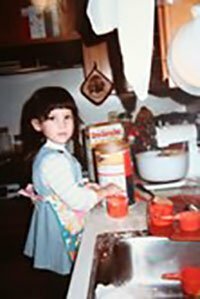 My food journey probably began way back when I was a kid and my parents agreed to let me plan and make one dinner per week for our family of six. They didn’t know it then but they were allowing me to take the first step on a lifelong journey with food and health, allowing me to be creative and innovative so that eventually I would develop a passion for food that would drive my life. These days, I am planning and cooking meals for my own family – a husband and three growing boys. I sit down once a week and look at our family calendar and choose meals that fit into our life, using local and seasonal ingredients as my inspiration. I love to try new recipes and switch out ingredients depending on what I have on hand or what might make the recipe healthier. I am constantly reading and learning new ideas and ways to eat healthier, for our bodies and for our planet. I created this site as a place to record and share my recipe ideas with anyone else who might be on a similar journey or maybe just wants to try a new recipe today! Wherever you are in your own personal food journey, I hope that you find something here that you like! “Cooking is like love. It should be entered into with abandon or not at all.